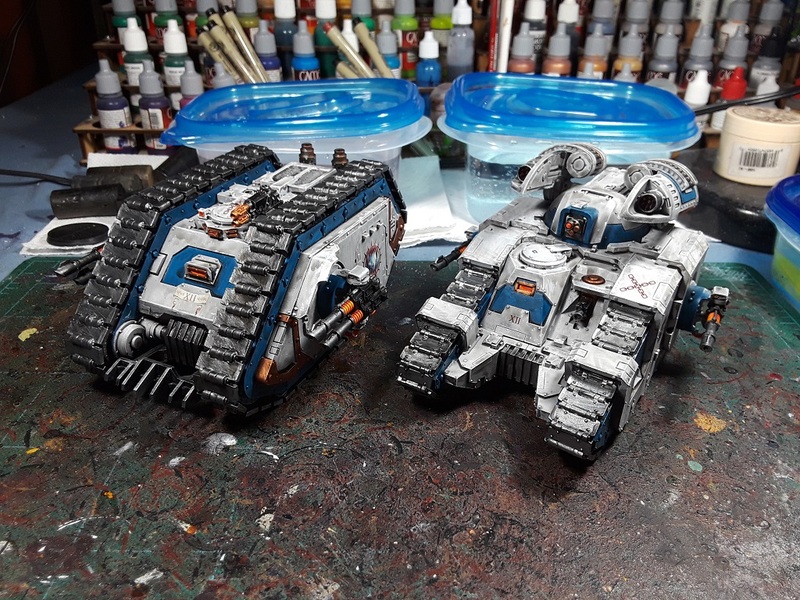 Mordian 7th Regiment: Heresy Era World Eaters - Tanks in progress and command squad built! Heresy Era World Eaters - Tanks in progress and command squad built! 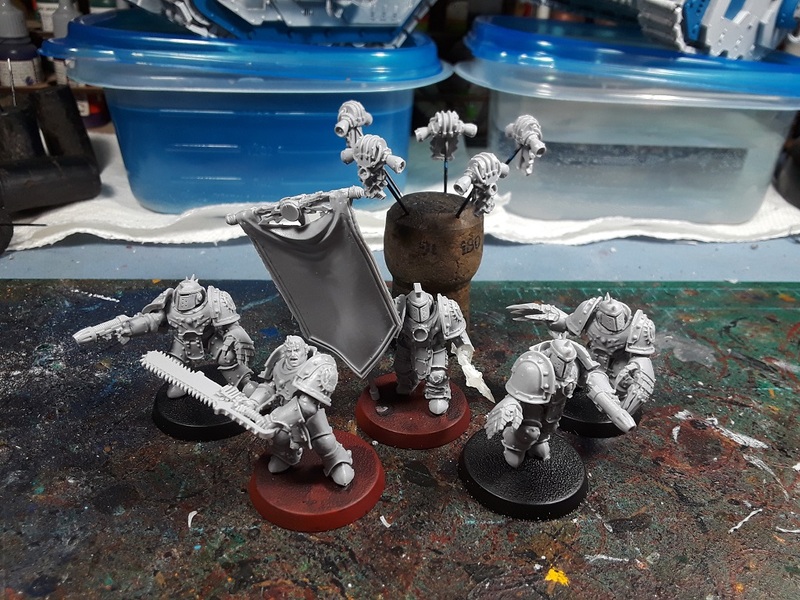 Tried to include a mix of weapons and poses, hard to go wrong with a couple dudes with power fists and plasma pistols though. Thought one of 'em ought to have a pair of lightning claws, and it was pretty much a given that I needed to include one guy with an eviscerator! Pretty happy with the contained aggression the standard bearer ended up with as well. They should be a hoot to paint! On the other side of the coin I did run into a slight issue when painting the tanks. As I'd feared, the recipe that works pretty well on infantry doesn't translate perfectly to the large flat panels of the tanks, and the wash step got pretty streaky. For the most part I'm hoping to play it off as weathering, and once I got some of the detailing and spot colors on they're starting to look reasonable. There's still a fair bit of mud and grime that I'm going to be adding, which should help as well. 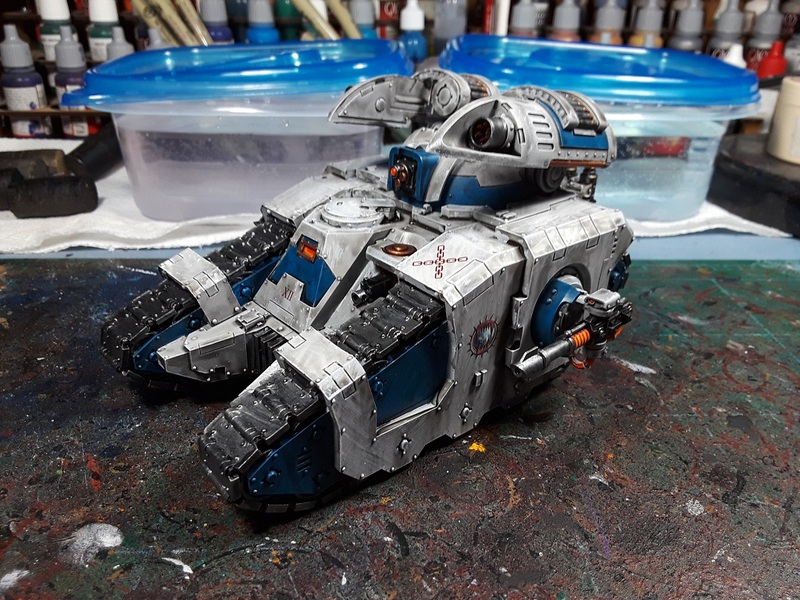 I always loved the old Proteus Land Raider, and even through it's not an assault vehicle it still finds its way into many of my armies. It just suits the heresy-era aesthetic so well! For the purposes of the force for adepticon it will likely not even carry any troops and just act as a battle tank, though depending on the mission the five-man missile launcher heavy support squad might catch a ride in it as needed. Trying out a new Sicaran variant with this army and included an Arcus. Not sure how it'll perform on the tabletop but on paper it seems pretty fierce. It can carry numerous missile types making it capable of dealing with a number of different threats ranging from infantry to aircraft and pretty much everything in between. It's not cheap to buy all the various payloads but I'm thinking it'll likely be worth it! ...Or it'll be blown to scrap in turn one every game. One of the two. Heh. An excellent suggestion - I'll have to give that a try! Thanks! They're gonna get muddy and streaky soon! Usually keep my tanks reasonably clean but I figure the World Eaters aren't too fussed about keeping 'em pretty! Always tricky to apply the same formula across to tanks as to troops but well played for pushing forward with it. 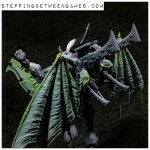 That command squad jumping out of a Dreadclaw will look ace. Indeed - I'd hoped the 50/50 mix of Lahmian Medium and the Dark Tone wash would have helped avoid the tides, but alas... 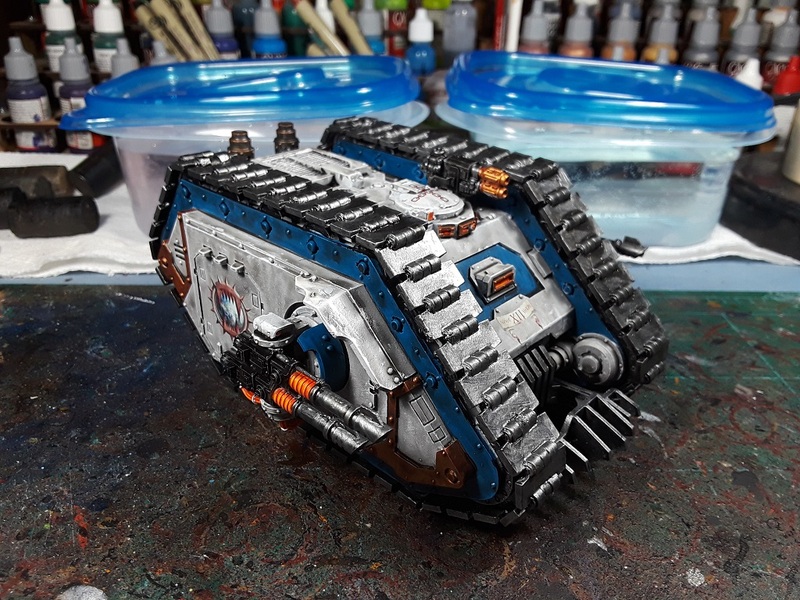 I'll turn it into weathering in the end, I reckon! I lost track. Have you done every Legion yet?